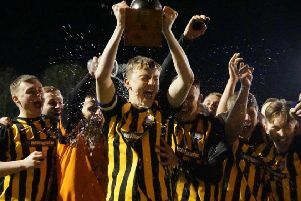 Worksop Town are celebrating winning the Northern Counties East League Premier Division Championship — and a return of Evo-Stik football next season to Sandy Lane. The Tigers won 4-0 at Albion Sports to clinch a 16th consecutive victory and the title in style. Matt Sykes gave Worksop the perfect start with a powerful finish from the penalty spot in the 26th minute. Five minutes later Craig Mitchell looked to have made it 2-0, but his finish was ruled out for offside. However, the Tigers did double their advantage in the 35th minute when the ball was deflected ito the path of Steve McDonnell and he smashed home. The now rampant visitors made it 3-0 two minutes later as Lee Hill’s free-kick went in off the bar. To make matters worse for the home side, Alhassane Keita was then dismissed for violent conduct. Two minutes before half-time it was 4-0 as Sykes fired in his second to seal the title. Manager Craig Denton (above) said at the final whistle: “It is amazing. All the credit goes to all the players who have been involved with us this season. “The group of players we have got are really special. Denton also thanked his management team for their contribition.